Intermarriages between Filipinos and Chinese have become quite common since the Chinese arrived from mainland China many decades ago. Over the years, the Chinese have assimilated into Philippine society, doing business with Filipinos, learning their language, and sending their children to Filipino schools. The Filipinos, in turn, have also transacted with the Chinese. A partnership thus flourished, bringing about intermarriages and producing the Chinese-Filipinos or the Tsinoys. As a subculture within mainstream Filipino culture, the Chinese Filipinos have unique, elaborate, and interesting ceremonies and wedding traditions. One of the most important traditions is the engagement ceremony, or the Ting Hun. Similar to the Filipino tradition of “pamamanhikan,” the Ting Hun is a form of betrothal in which a formal announcement of the engagement is made. During the ceremony, the groom’s family presents “gifts,” for instance, jewelry and goods, to the bride’s family as a way of acknowledging the effort of the bride’s parents in raising her. In turn, by accepting the gifts, the bride’s family pledges her to the groom. 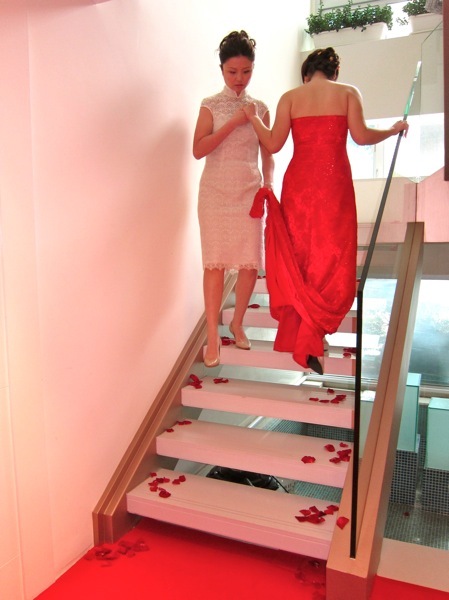 The engagement ceremony is a common practice in mainland China. This came about because of the presence of “matchmakers” who would arrange for couples to meet. The families of the couples knew of each other only through the “matchmaker,” so a display of gifts was necessary in order to assure the bride’s family that she will be taken care of. These gifts are called Ke Tseng or dowry. As the Chinese migrated to the Philippines, they took these rituals with them and practiced these in varied contexts. In sociology, the symbolic interaction perspective is primarily concerned with how people create shared meanings with regard to symbols and events in daily life. It assumes that groups form around interacting individuals, and it is through these interactions that people learn to share common understandings and meanings with one another. Symbolic interactionists argue that humans are not merely passive agents responding to their environment. Instead, they are actively engaged in creating their own meaningful social world based on their own interpretations. Thus, humans modify the meanings and symbols as they struggle to make sense of the events that they experience. In this article, we will examine the Chinese engagement ritual through the lens of symbolic interactionism. We will answer the following questions: What are the meanings behind the engagement ceremony? What material objects are used and what do they represent? How do Chinese Filipinos practice human agency – i.e. how do they negotiate some of these rituals in order to re-create some aspects of the ceremony? Finally, what is the product of these negotiations? There are multiple meanings embedded within the engagement ceremony, depending on the objective of the couple and their family. Cultural Identity. To some, the engagement ceremony is an assertion of their cultural identity as members of the Chinese Filipino subculture. It serves as the couple’s avenue of continuing the rituals and traditions passed on to them by their parents. Union of the two Families. To others, the engagement ceremony is a way of strengthening the bond between the two families. This is mainly because the Chinese Filipino are family-oriented; they see the family as the primary source of love, security, and protection. They believe that if the two families live in harmony, then their life affairs will prosper. Assurance of Financial Security for the Bride. Because the man can afford to offer different types of goods (such as food and jewelry) to the woman, the gifts given in the ceremony serve as an assurance from the groom’s family that they could provide for the bride. Status Symbol. The type of restaurant / hotel, the brand of watches, and the kinds of jewelry and goods that will be exchanged during the ceremony, are also ways for the couple to showcase their social class. The event itself is a status symbol: it is the couples’ way of showing their guests that they can afford to spend a huge amount of money on their engagement. As the groom’s family acts as guests asking for the hand of the bride in marriage, they are expected to prepare the gifts and pay for the banquet to show respect to the bride’s family. On the other hand, the family of the bride must treat the venue as their own home, so they should arrive first, and should welcome and entertain the guests of the couple and their families. There is no “required” list of gifts that should be given. The type of gifts depends on the financial capacity and generosity of the two parties. However, all gifts should come in pairs. As the Chinese saying goes: “all good things come in pairs.” It is therefore quite common for the Chinese to repeat characters even in their brand names. Interestingly, the character Sanghee, or double happiness 囍, created as a sign for wedding occasions, also comes in pairs. Piling up two Chinese characters – “喜” (Happiness) into “喜喜” (Double Happiness) – serves not only as a symbol for more happiness but as an indicator that the newly engaged will soon become a couple. Noodles (Misua). For the Chinese, noodles are a symbol of longevity and are also part of many other celebrations such as birthday parties and wedding ceremonies. Eggs. The Chinese believe that eggs symbolize fertility. This is to anticipate and look forward to the family that the couple will build in the future. Cake. The sweetness of the cake symbolizes a sweet and rich life for the couple. The cake should also be round, signifying some form of family reunion. Chocolates, candies, and other sweets. Similar to cake, these goodies also symbolize a sweet beginning for the couple. Jewelry. The necklace, bangle, and watches are a symbol of the financial capacity of the groom to provide for the bride. As mentioned above, symbolic interactionism emphasizes the process that each individual goes through in actively creating and re-shaping his or her social reality and identity within a social setting. Through the interaction between the couples and their respective parents, certain rituals and practices are negotiated in order to reach an agreeable ceremony proper. According to Teresita Ang See, the younger generation of the local-born Chinese Filipinos has largely broken away from rigid traditions. Slowly, they have become more integrated into mainstream Philippine society and have come to identify themselves as mostly Filipino. Such identity is partly a product of the negotiations between children and parents. Included in these negotiations is the celebration of various rituals. Among the rituals and traditions that need to be negotiated is the Ting Hun. While most Chinese Filipino couples see the engagement ceremony as a pre-requisite for marriage, there are also those who prefer not to have any engagement ceremony at all. Instead, they insist on a simple exchange of jewelry without the rituals and banquet. In this instance, they compromise by still performing certain elements required of couples, but do away with those elements that make the ceremony a costly event. Should the couple decide to have the engagement ceremony, the next element that parents and children need to settle is the date of the event. The Chinese Filipinos believe that it is important to select a date that is favorable and auspicious for such special events in order to increase success in married life. Getting engaged during well-chosen dates will bless the event with more positive energy and help start off the couple in their marital journey. However, some of the younger generation Chinese Filipinos do not practice this tradition as they see it as impractical. Some couples would assert the most convenient date, rather than the most auspicious, for the ceremony. The third issue to consider is the location of the engagement ceremony. Traditionally, the engagement ceremony is held at the residence of the woman. Today however, most of the Chinese Filipino couples opt to hold the engagement ceremony in restaurants and hotels, a practice that is perhaps influenced by the proliferation of restaurants and hotels that offer services and facilities for these kinds of special occasions. Further, the notion – one that could have stemmed from certain mainstream Filipino values – of having to invite everyone to the celebration necessitates larger venues. As such, couples with huge families and a high financial capacity tend to choose hotels and restaurants for the Ting Hun. The fourth element that requires compromise between the parties involved is the type of gifts that will be exchanged during the ceremony. There are couples who prefer to exclude a number of items, for instance, rice or fruit cocktail, as these can be too heavy to carry. Jewelry is also negotiated. Although there is a general list of jewelry to be exchanged (watch, bangles, and necklace), there are those who go beyond this list and give more. On the other hand, there are also those who exchange one type of jewelry only. Aside from this, the brand of watches as well as the type of stones (whether diamonds, emeralds, or pearl) in jewelry sets will also be negotiated, depending on the financial status of the family or the couple’s ideas of practicality. One thing is certain: these gifts always come in pairs. Finally, other rituals and practices associated with the Ting Hun are also negotiated by the couples and their families. For instance, some couples carefully consider the Chinese zodiac sign of their guests to determine whether or not these are compatible with theirs, prior to inviting them to the ceremony. Those with incompatible zodiac signs will not be allowed to witness the ceremony proper. However, there are couples who do not subscribe to this tradition. Furthermore, there are couples who deliver formal invitations to their guests, while some choose to announce it through an ad in the local Chinese newspaper. Some opt for the gift giving ceremony to go first before the tea drinking ceremony; others do it the other way around. At the end of the day, the final decision rests with the couple and their parents. The couple and their parents need to adjust and make compromises based on the circumstances they find themselves in. Their financial capacity, family size, and the level of adherence to tradition are some of the many factors that can influence decision-making for the engagement ceremony. On the day of the engagement ceremony, the bride’s family arrives early in order to welcome the guests and visitors to the venue. After settling down, a procession led by the groom and his family will then take place. The groom enters the venue and goes down the aisle carrying a box of corsage or a bouquet of flowers. Four male relatives of the groom follow, with each pair carrying a Sin Na (a Chinese word for “gift”). 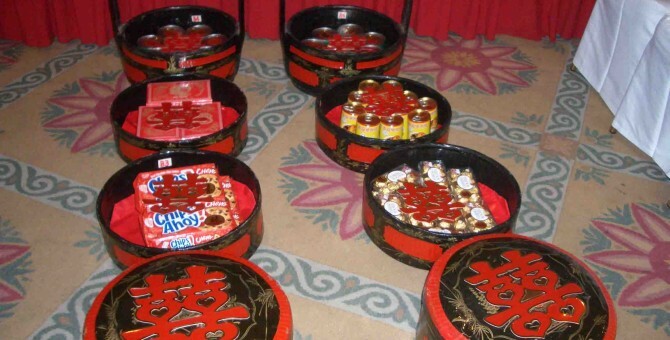 The Sin Na is a four-layered bamboo box, usually filled with fruits, herbs, jewelry, and other goods that signify prosperity and happiness for the couple. The parents of the groom, together with his other relatives, round up the procession. After the procession, elder representatives from the bride’s family set up the ceremonial table, placing red satin cloth over it. 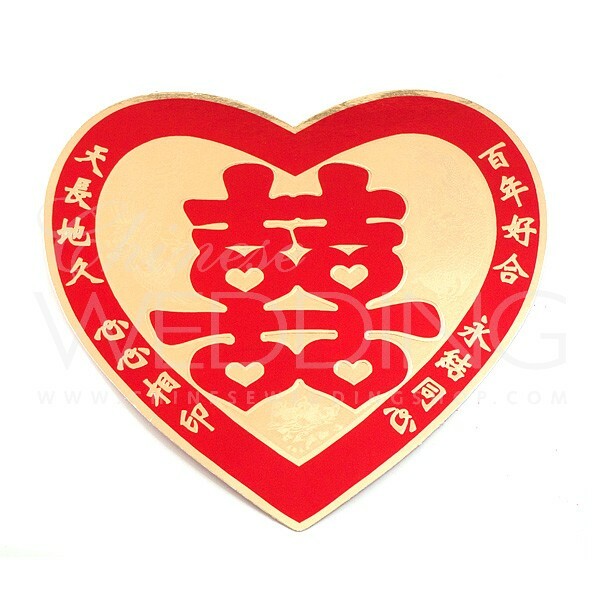 The color red symbolizes joy and happiness for the Chinese. After the gifts are placed on top of the table, representatives from the groom and bride’s side take their respective seats in front. The bride then enters the room walking backwards. This symbolizes the avoidance of negative energy in the room. It also prevents the bride from seeing the groom. The bride is turned clockwise three times with the help of a “lucky lady.” This lady, according to Chinese custom, should be married with kids, healthy, and wealthy. She will serve as a “role model” for the bride to emulate. The bride can now take a look at her groom. A female relative of the bride then serves welcome drinks to the members of the entourage. The juice, which symbolizes happiness and good luck, is served from eldest to youngest members of the entourage, to signify respect for the elders. The marrying couple is then served last. After the drinks, the gift-giving ceremony takes place and the jewelry gifts will be worn by the couple. Once all the gifts have been exchanged, the tea ceremony is then conducted. For the Chinese, tea is a very important component of any celebration because it symbolizes respect. During the tea drinking ceremony, the bride serves the groom’s family, from the eldest member to the youngest members. The groom then does the same thing for the family of the bride. When everyone has had his or her tea, picture taking will now commence. Once the picture taking comes to an end, sweet tea soup and noodles are served to the entourage. Both symbolize harmony between the bride and her new family, as well as a long-lasting relationship between the groom and bride. After this, the family members of the bride give away flowers to the single ladies in the venue. 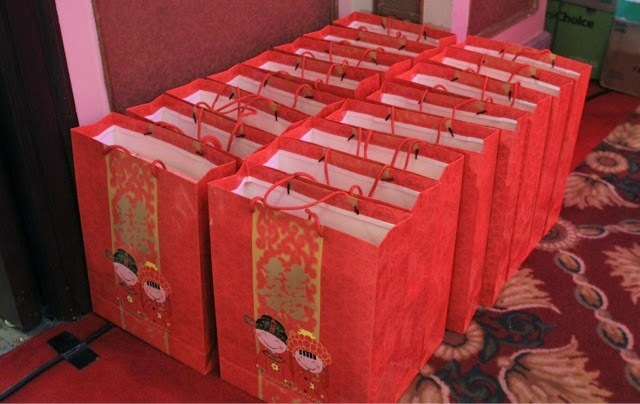 They also distribute the give-away bags (filled with fruits, noodles, and sweets) to the relatives and special guests of the couple. As the engagement ceremony nears its end, the groom will carry the cake with the bride’s name. One of his relatives will carry the cake bearing his name. The two will walk (or drive) around the block of the ceremonial venue twice. Walking or driving around is like forming a circle, a shape which symbolizes the unending union of the couple. This may also signify that the couple will always share the same path in life. The engagement ceremony ends with everyone partaking of the food prepared for them. In conclusion, Chinese Filipinos celebrate the Ting Hun ceremony in an elaborate and sometimes grand manner. The ceremony involves rituals that symbolize various beliefs. Rituals have enabled individuals in primitive and traditional cultures to establish and affirm their common bond, and such is also the case with Chinese Filipinos who decide to perform the engagement ceremony. This echoes the arguments of Emile Durkheim that rituals are social facts that bring about social integration, benefitting society as a whole. Aside from this, the Ting Hun ceremony is a symbol of welcome, accommodation, generosity, and even financial capacity. It involves beliefs about what is lucky and auspicious. With statistics on marital separation on the rise, couples really need all the luck they can get!